Home » Tamil » News » Kattappa aka Sathyaraj to feature in director Sundar C’s Sangamithra? Reports are doing rounds that the actor is being considered for a major role in period drama Sangamithra. Period drama film Sangamithra, to be directed by Sundar C, was in the news recently after actress Shruti Haasan opted out of the film stating she did not receive a bound script for the film. The makers since then have been on the lookout for a replacement and have been considering many top actresses in South India for the role in Sangamithra. While all this is happening, reports are doing rounds that there might a new entrant in the cast of the film which will be a boost for the film. According to emerging reports, Kattappa of Baahubali. Sathyaraj might be roped in for an important role in Sangamithra. Touted to be on a budget of INT 150 crores, Sangmaithra stands as the most expensive film in the career of Sundar C and the producers Sri Thenandal Films. 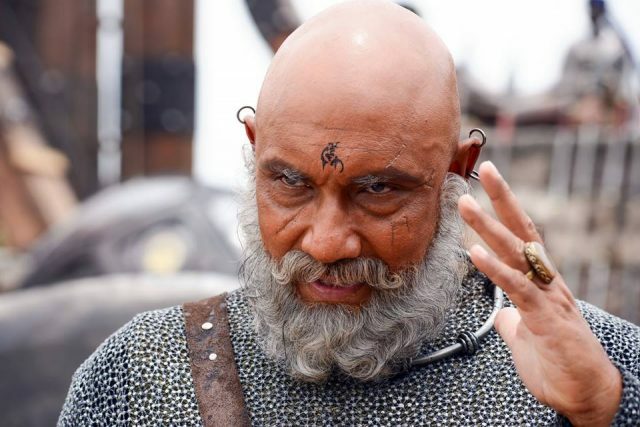 Sathyaraj, who became a popular figure across India for his role s Kattappa in Baahubali is now being considered for a major role in Sangamithra and the makers might soon seal the deal, according to reports. Sangamithra also features Jayam Ravi and Arya in lead roles. Sangamithra was launched at the Cannes 2017 amidst much hype and received a lot of positive reviews for the first look posters of the film. However, when the makers announced that Shruti Haasan will not be a part of the film due to unavoidable circumstance, it came as a shocker to the Tamil film industry. The producers did not mention the reason as to why she wouldn’t be a part of the film. The rest of the cast including director Sundar C and Shruti Haasan haven’t yet responded to this news.